Former premier Su Tseng-chang （蘇貞昌） is to be sworn in as the new premier on Monday, President Tsai Ing-wen （蔡英文） said yesterday. The appointment came in the wake of the Democratic Progressive Party’s （DPP） heavy losses in the Nov. 24 local elections, which led to Tsai’s resignation as party chairperson and the Cabinet’s mass resignation on Thursday. At a news conference at the Presidential Office in Taipei, Tsai said that she asked Su to take the role as he possesses three characteristics the nation needs at this moment: experience, boldness and the ability to get things done. Su’s philosophy of “breaking new ground” was evidenced by his campaign last year for the mayorship of New Taipei City through his employment of young campaign employees, innovative policymaking or creativity in promotions, she said. In addition to fulfilling its promise to “make Taiwan great,” the administration would from now on focus more on equitable distribution of public resources and caring for disadvantaged people, Tsai said. The nation is facing numerous challenges this year, including a US-China trade dispute and Chinese President Xi Jinping’s （習近平） proposal to introduce a Hong Kong-style “one country, two systems” formula for Taiwan, she said. “This is a year for us to strive to improve people’s lives, defend democracy and safeguard our sovereignty,” she said. 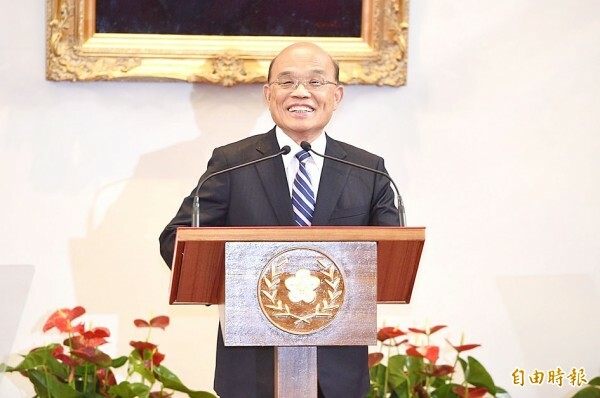 Tsai said that she would work closely with Su, whose decades of experience would enable him to lead with conviction as they help the nation navigate ever-changing international situations. She extended her gratitude to outgoing Premier William Lai （賴清德） for his “pragmatic” approach that has helped the government achieve many of its goals in terms of reform and development. “This is a daunting task at a critical moment,” Su said, thanking Lai for his team’s outstanding governance, which has laid the groundwork for Su’s team. He added that he would strive for even greater achievement. Churchill during World War II led the UK through its darkest hours, and after the war he again served as leader to the great acclaim of Queen Elizabeth II and the public, despite his age, said Su, who is 71. “I shall roll up my sleeves and lead my team to meet the public’s expectations and bring the government in sync with public opinion,” he said. Comparing himself to a “middle relief pitcher” for the DPP and Su as the “closer,” Lai praised Su’s “invaluable” experience and wished him good luck. Later yesterday, former Taichung mayor Lin Chia-lung （林佳龍）, who lost his re-election bid in last year’s elections, said on Facebook that he has accepted Su’s offer to serve as minister of transportation and communications.